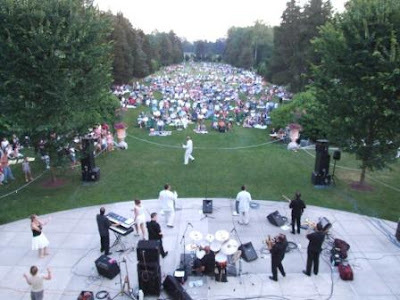 Wadsworth Mansion Blog: Summer Concert Series in July! Summer Concert Series in July! Once again the Friends of Long Hill present their annual summer concert series on the south lawn of the Wadsworth Mansion. We welcome guests to bring a picnic dinner and enjoy an evening with family, friends and great musicians. Grounds open at 5:30 p.m. and the concerts begin at 6:30 p.m. The event is free and you can find free parking at the Mansion, at the Wilbert Snow School: 299 Wadsworth Street, and at Mercy High School: 1740 Randolph Road. Opening the 2011 Series on July 6th will be Prelude playing music from the '80s to the present. Prelude covers all of the great songs, including classic pop and rock, funk, disco, swing, country and Motown. Prelude has been together for over twenty years and has performed throughout Connecticut, Rhode Island, New York, Massachusetts and Vermont. The July 13th concert will feature the Hartford Jazz Orchestra. The Harford Jazz Orchestra has been entertaining people for over 45 years. Lead saxophonist Seb Giacco has been with the orchestra since its formation in 1965 and looks forward to performing in his hometown. A favorite with the audience this is the sixth time the orchestra has performed at the Mansion. Making their second appearance at the Mansion on July 22st is The Michael Cleary Band. The Michael Cleary Band is a Hartford institution. They are celebrating their 19th year of making original Groove/Funk/Rock music with a twist and have been called Hartford's answer to the Allman Brothers. Their shows are filled with great songs, monstrous solos, epic jams, funky grooves and wacky humor. All in all, a diverse, joyous musical stew played and sung by talented musicians who love what they do. The concert series will conclude on July 27th with The Glamour Girls. With a show highlighted by costume changes and eye-catching choreography, The Glamour Girls present a song selection ranging from the swing of the 40's to the early 60's Sock Hop to the Motown/Soul era, to the disco dance hits of the 70's, to the pop/rock chart-toppers of the 80's and 90's. Concerts will be held in light rain, or the threat of showers. Concerts will be cancelled in electrical storms or threat to the wellbeing of the musicians or their instruments. We hope to see you there! Happy 10 Year Anniversary, Shannon & Frank!